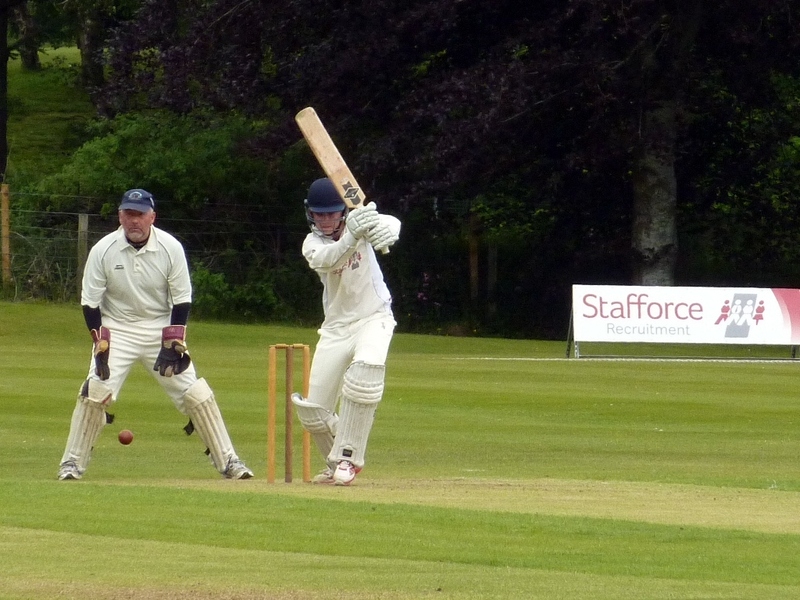 In the Western Premier League on Saturday, Stafforce Dumfries registered a good five wicket win at Coatbridge side Drumpellier. A fine effort in the field restricted Drumpellier to 129 all out with four wickets for twelve runs to D&G Fire Protection Man of the Match Chris McCutcheon and two to Niall Alexander and Chris Bellwood. Alan Davidson and Drew Dawson set up the win with a fifty opening partnership, each scoring 30, but it required Chris Bellwood to see the side home with a top score of 35 not out aided by a not out innings of 15 from Niall Alexander. In the Western Premier Reserve League it was another close finish at Nunholm. Nunholm set a total of 224 for 4 against Langloan. Fifteen year old Chris McBride top scored with 73, the Solway Print Man of the Match Jerry Goodin scored fifty and Adam Elliott and Davie Davidson contributed thirties. Gurupal Singh then took three wickets, and Goodin two, as Langloan got close finishing seventeen runs short in the third last over when a direct hit from the boundary by Dave Strachan dramatically ran out the last man. Dumfries’s Scott Beveridge finished off his matches for the Scotland Reivers in the North Sea Pro Series by contributing runs, two scores in the twenties, in his side’s two T20 matches against the Highlanders in Dundee. The latter’s two wins saw them win the ten match four team series which included two Dutch sides. On Friday, Dumfries U13s won a close fought match at Galloway by just six runs. The Club’s Coaching for Juniors takes place at Dumfries Sports Club on Mondays, 6:15-8, suitable for boys and girls, P4 to S1. For details contact Trefor Williams (01387 256455), or the club on dumfriescricketclub@gmail.com, 07799 856094, or see www.dumfriescricketclub.co.uk, Facebook or Twitter. On Saturday, Stafforce Dumfries play at West of Scotland in the Western Premier League and Nunholm play Partick at home.